This plugin will display your passwords that are on client and location levels in labtech and present them for sending in screenconnect sessions. Gone are the days of copy/pasting passwords. 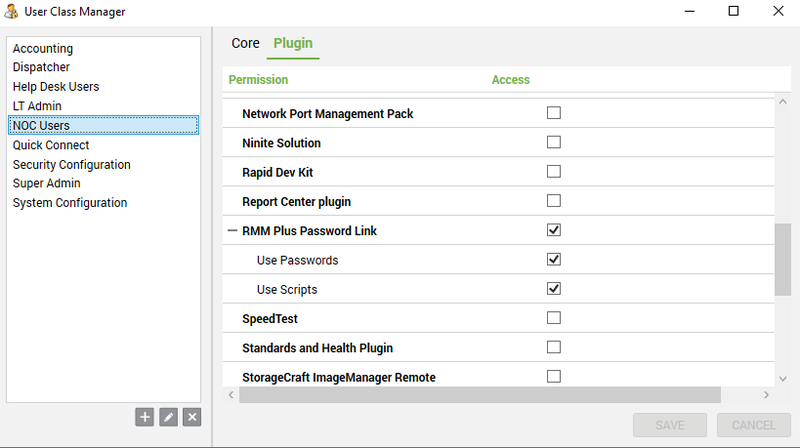 First, head over to the extensions section in ScreenConnect and install the RMM+ passwords extension. Second, install the attached Labtech plugin. Third, go and configure some timeout settings. A. Token Valid For How Many Minutes: This setting is an absolute token timeout in miniutes. set to -1 to make tokens last forever. B. Token Idle Expire Minutes: This setting is an idle timeout so if the plugin isn't used or a password isn't queried or passed for this many minute it will invalidate the token. Fourth, set permissions for the plugin. Fill in your Labtech server url(please only use SSL or you will be sending passwords in clear over an unencrypted connection),Labtech username and Labtech password. Decide what items you want to show and login. 1.0.7 - Added ability on login form to save username. Fixed issue where command section would lose access key used to send commands. 1.0.8 - Fixed bug that wouldn't allow brackets in script names, password names or password values. 1.0.9 - Fixed a bug that was introduced in the regex in 1.0.8 that would not allow it to detect empty results. Added ability to type "wake" into the command line and send the ScreenConnect version of wake to computer. 1.0.10 - Corrected issue with wake command not being recognized if case was not all lower. 1.0.11 - Corrected issue to properly escape strings sent in commands. 1.0.12 - Updated command to not wait full timeout if data returns quicker. Also prepends !#timeout to the command for SC. 1.0.13 - Updated script list to contain actual folder structure as appears in LT. Added a password filter box. Now allows to show/hide sections on demand and includes a client/location picker that allows you to change locations or clients so if you have generic passwords stored on your internal client location for instance. Added ability to hide passwords per user to get rid of the extra clutter that isn't needed. 1.0.14 - Various CSS fixes(thanks Andrea). Added filter box to auto highlight top match in password list and enter key will send highlighted match. 1.0.20 - Added ability to send carriage return after password. 1.0.0.2 - Added permission requirement to Read Passwords for client. If a userclass doesn't have the Read Passwords permission it will not let them go to the SC plugin. 1.0.0.3 - Added the ability to show username instead of display name as password identifier. 1.0.0.5 - Corrected issue with incorrectly determining permissions(Thanks Eric Besserer for the help). Added ability to block/allow script scheduling per location. 1.0.0.7 - Fixed issue where login token was set for more than 24 hours would invalidate each night. Various other bugfixes. 1.0.0.8 - Added regex include and exclude options for selectively showing passwords. 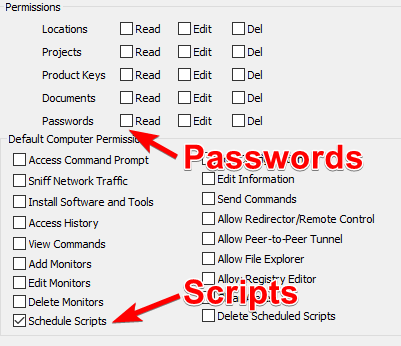 1.0.0.9 - Added auditing of passwords sent, passwords copied and scripts sent to the Dashboard Audit section. 1.0.0.11 - Added ability to regex include or exclude password from view globally. Security update to only show clients in client selector that someone has access to. 1.0.0.13 - Fixes to regex include/exclude and superadmin permissions. 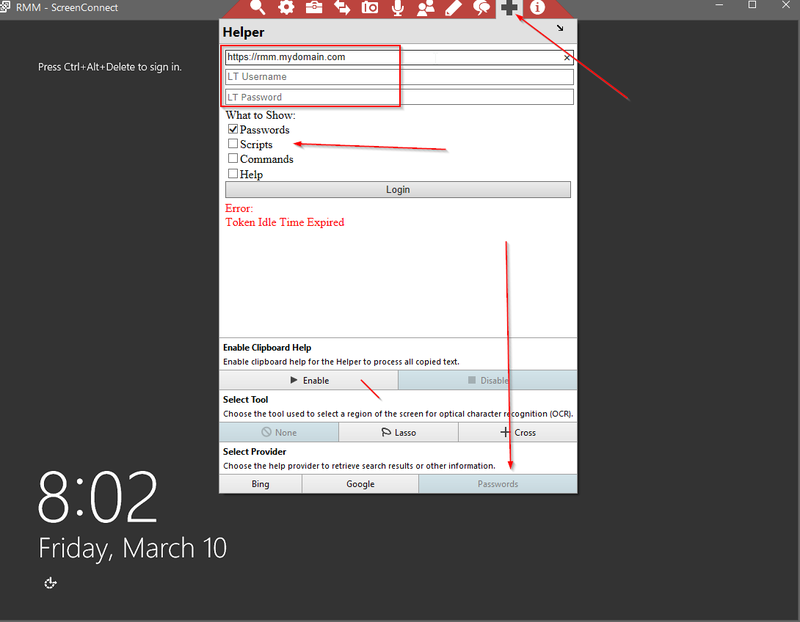 1.0.0.14 - Added ability to send carriage return after password. EDIT: as of the labtech version 1.0.0.5 permissions need to be enabled on a client basis for users to have access to passwords and scripts. I cant seem to get the textboxes to show. I've tried it on two different SC servers, same results. Am I missing a step? To send a password to the screen click it. To run a script on the machine double click. To run a command type the command and timeout and hit enter. 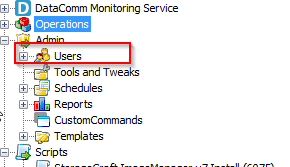 Did you get the permissions setup for your user account in LT? Hey @bigdessert I seem to be running into a snag with this. When logging in all I see is the Login button turn blue. Noting happens after that. Do you have any logging that I can look at? I configured your server on my system and it is coming back saying invalid password. This means the LT plugin in communicating like it should. Are you still getting the issue? Ok, what the issue was... I was playing around with another website on my LT server and had set the LT website to use a specific IP address, well that broke the Patch manager and must have affected this as well. Since putting that setting back to all unused IP's this plugin as well as other are a whole lot happier. Glad to know you got it working. Hopefully it saves you tons of time! Literally three days ago, I was speaking with my boss about ScreenConnect/LabTech/ConnectWise and how it would be SO sweet if they could make this work... and tonight, I landed on this thread. Thanks for taking the time to pull this together. That said, I'm having an issue getting the extension to work on the ScreenConnect side. The extension is installed, but when I go to the helper icon, there is no password button there. Any ideas on what I might be able to try to fix that? I've verified user classes are set properly and the plugin is configured and working on the LabTech side. We are running LabTech 11, patch 10 and ScreenConnect version 6.0.11622.6115. Did you enable the plugin? You need to install and enable it. Please note that if you are running anything pre 6.1 on the ScreenConnect side you will have to login every time. ScreenConnect added persistent variable storage in 6.1 for helper functions. Yep, the plugin is enabled and working. 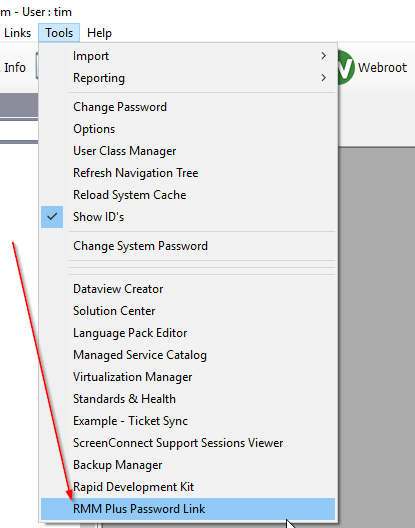 I was able to get to Tools, RMM Plus Password Link in LabTech and configure those settings. I figured our version of ScreenConnect might be a concern, so I just upgraded it. We are at the latest stable 6.1 release, but still, no password button under the helper menu. Are there any logs stored on the ScreenConnect side that I can review? The extension doesn't know anything about our server yet because I've never gotten to that point, so the LabTech ASP logs won't do me any good. Can you show me the plugins page? Sure thing - let me know if you need anything else. I'm not sure you use the Slack Channel, but you can DM me there @ tait_switchfast. Note that the reason this wasn't working is because tait@switchfast had installed the RMM+ plugin in ScreenConnect. 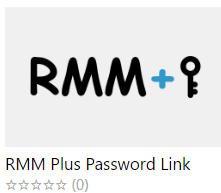 This is a different plugin called RMM+ Password Link. Please make sure you download that plugin. I am getting an error trying to install the plugin. Tried it from my desktop and the LT server. Are you LT 10.5 or 11? are you loading as a superadmin? 10.5 and i am a super admin. No i am not. I even tried to re download the plugin, but still get same error. I just posted another version of the DLL. Can you try it. If you've already tried installing the plugin before you do this, you might have to close the Control Center and reopen it and attempt it again after you unblock the DLL. I got the same error. Maybe its not compatible with LT 10.5.294?